Moved fridge about 22” by taking cabinets from right of fridge and moving them to its left. 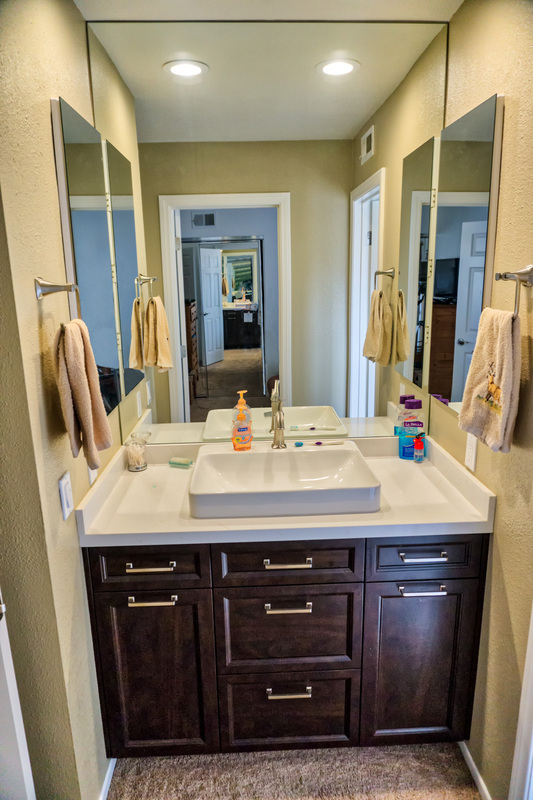 Powder Room Makover – New flooring, cabinet, counter, plumbing fixtures, lighting, vent, painting, and mirror. 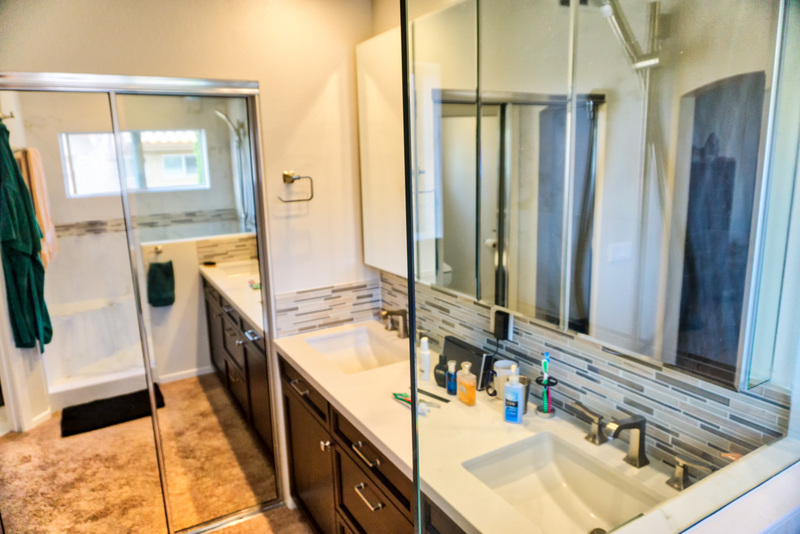 Master Bath – New storage oriented cabinets, plumbing fixtures, convert tub to walk in shower, lighting, and vents. This single father and his two young sons had just moved back into this condo he had rented out for the past 5 years. 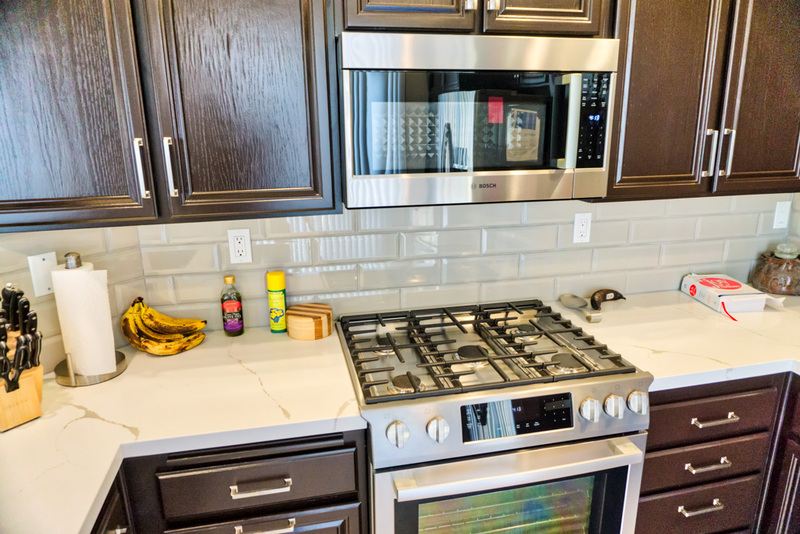 Originally built in the mid 1990’s with typical builder quality materials that were falling apart, this condo needed a makeover. The client wanted to make this unit comfortable for him and for his kids to grow up in. Making the most of the existing spaces functionally and using products that had high value, in terms of cost and expected long life span where the keys to his decision making, along with selecting products that fit the look he wanted. 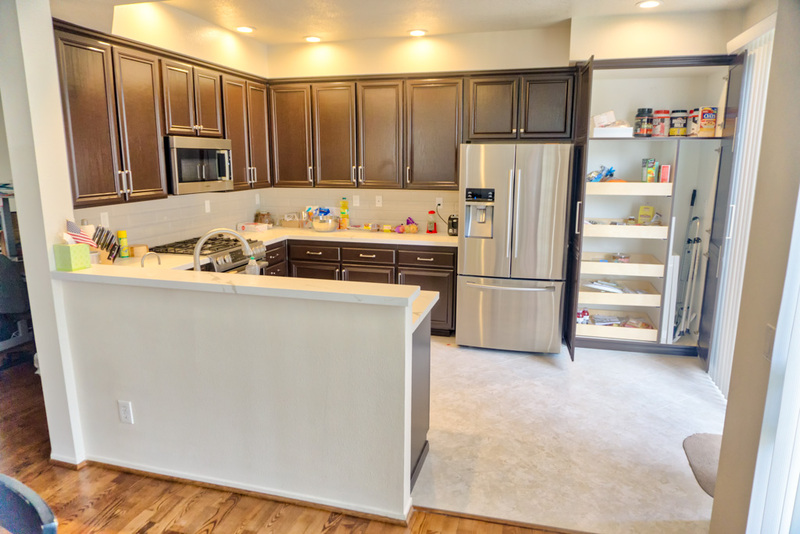 The kitchen was actually his lowest priority in getting this project done within his budget. 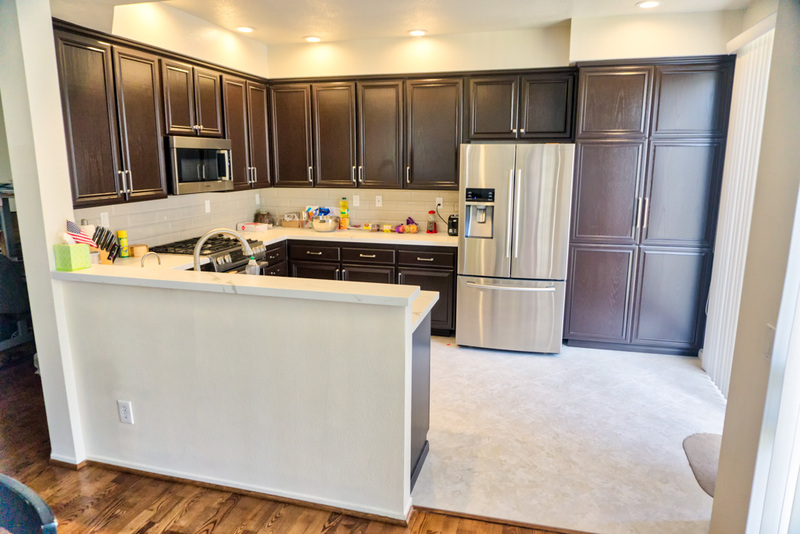 Instead of replacing the cabinets whose finish was noticeably peeling off, we started by making a slight modification and moving 22” of base and wall cabinets that were to the right of the fridge to the other side, sliding the fridge down and away from the range. We then made a large pantry and broom storage cabinet that uses the remaining space to the right of the fridge up to the wall. This change gave the client more usable counter space in his primary work area as well as more storage space overall. We put in new quartz countertops, with tile splash and a new Luxury Vinyl Tile (LVT) floor that looks like ceramic tile. We also removed the recessed fluorescent ceiling lights and replaced them with LED recessed ceiling cans. 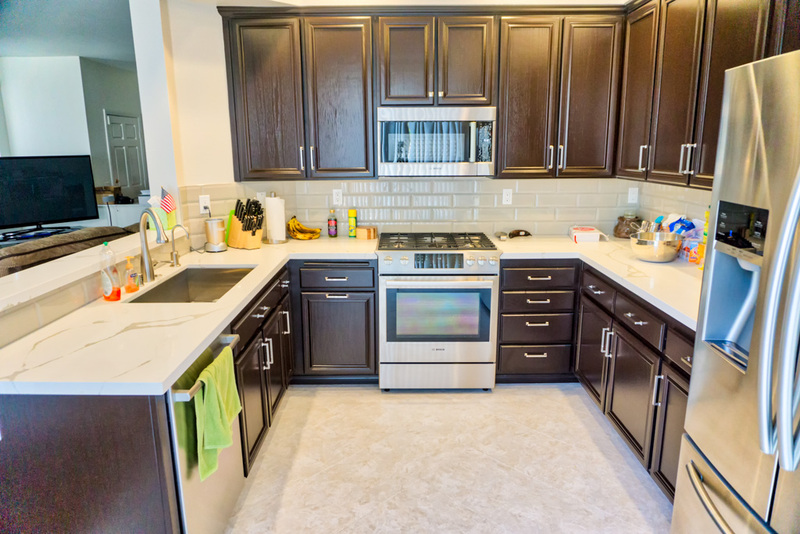 To finish the kitchen, we painted the cabinets a dark brown of a similar color to the thermofoil cabinets we used in the baths. LVT is a new product that is revolutionizing our top flooring choices for clients. It can look like wood or tile, has a long life expectancy (being originally a commercial grade product with long wear life), is extremely easy to clean and maintain, and is less expensive than the actual materials it is made to look like. 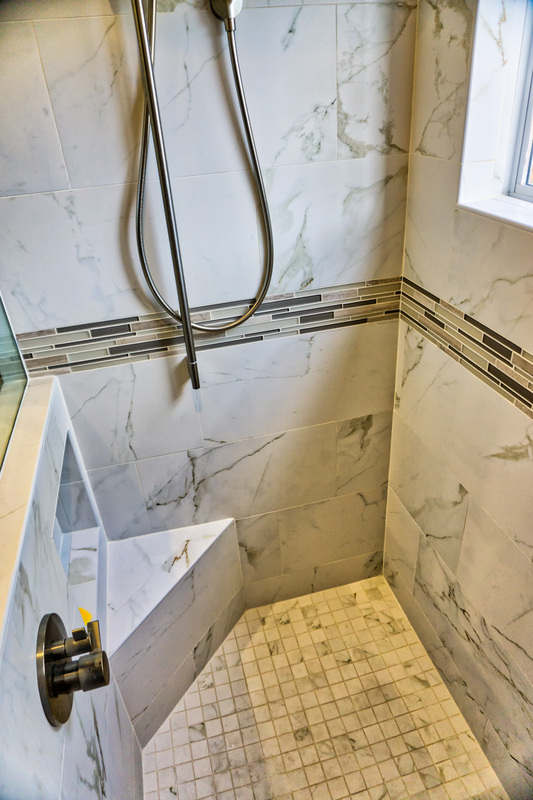 We used the same LVT in the kitchen, powder room, and the toilet rooms in the kids and master baths. The powder room was a simple makeover. 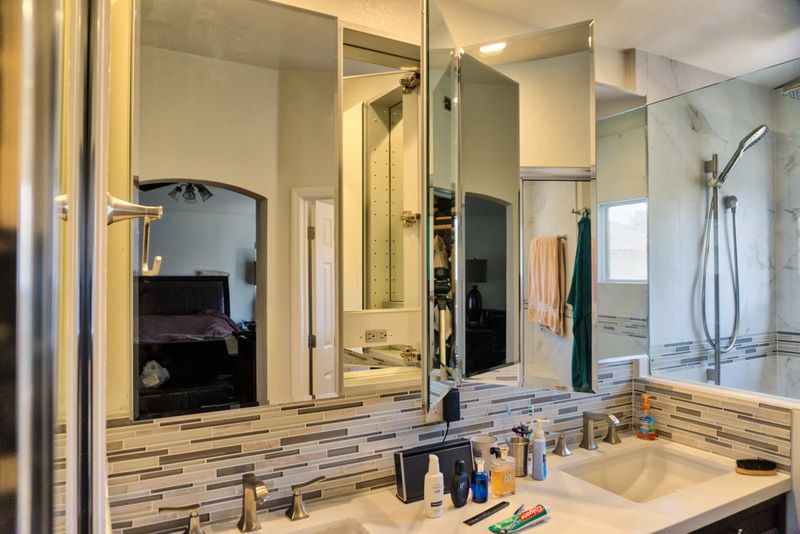 We installed new cabinets, counters, LED ceiling lights, LVT flooring, plumbing fixtures, mirror, and painted the walls. Only upgrade of special note is the new sink, an attractive glass semi-recessed vessel sink that partially mounts inside the cabinet and partially over the counter like a full vessel sink. The product specs say you can not see through the tinted glass into the cabinetry, but we found that to not be true during installation. 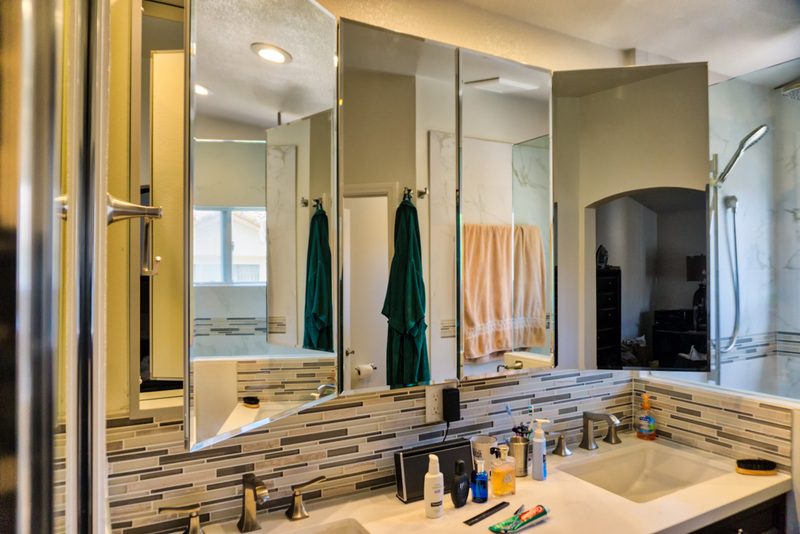 A tip I have on what we did to obscure the cut edges of the countertop substrate and cabinet edges: simply paint those exposed edges in black and they will cease to be visible when looking into the sink. 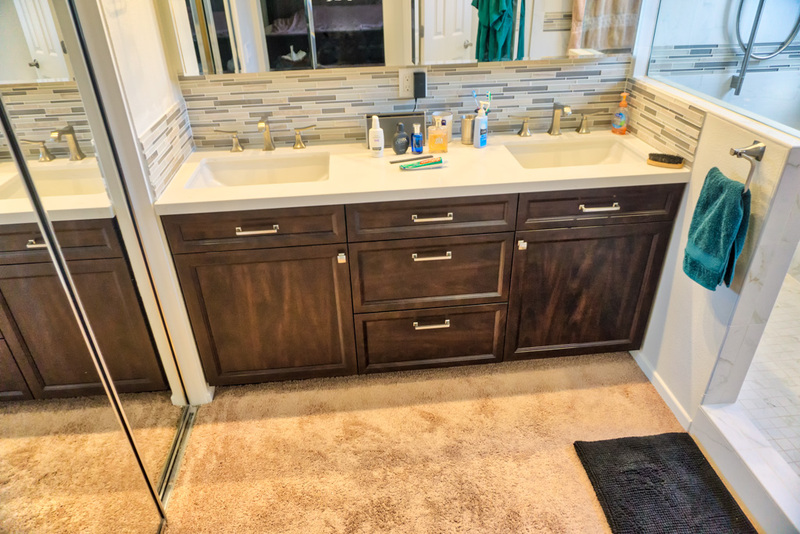 We used the same new thermofoil simulated wood cabinets for durability and to save money in all the baths. 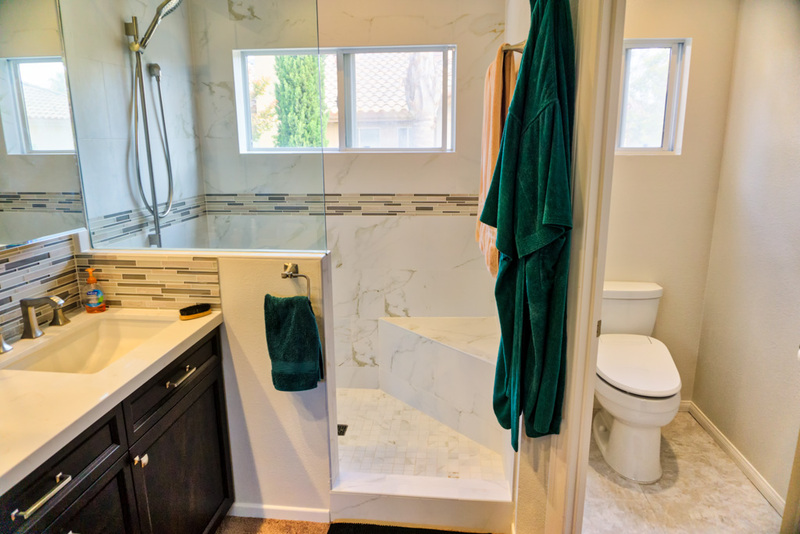 The kids bath cabinets are loaded with storage options. 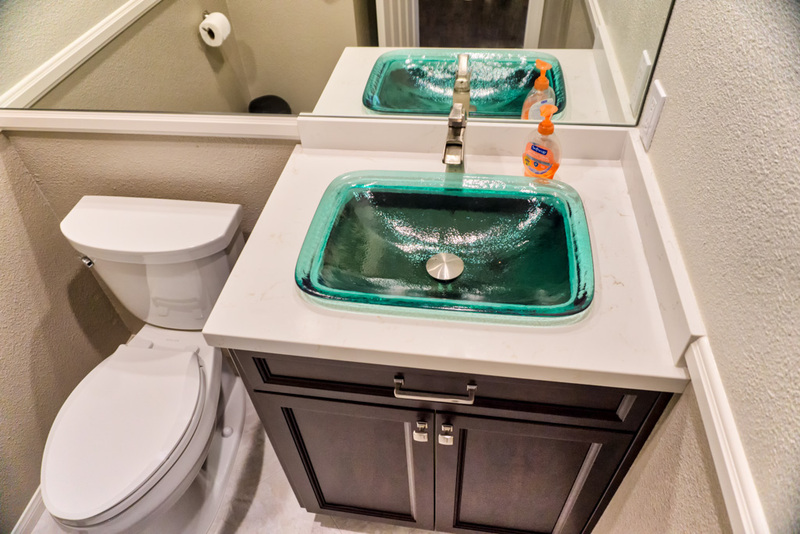 The use of another semi-recessed vessel sink allowed us to use a sink base cabinet much narrower than we would have with a normal undermount sink. 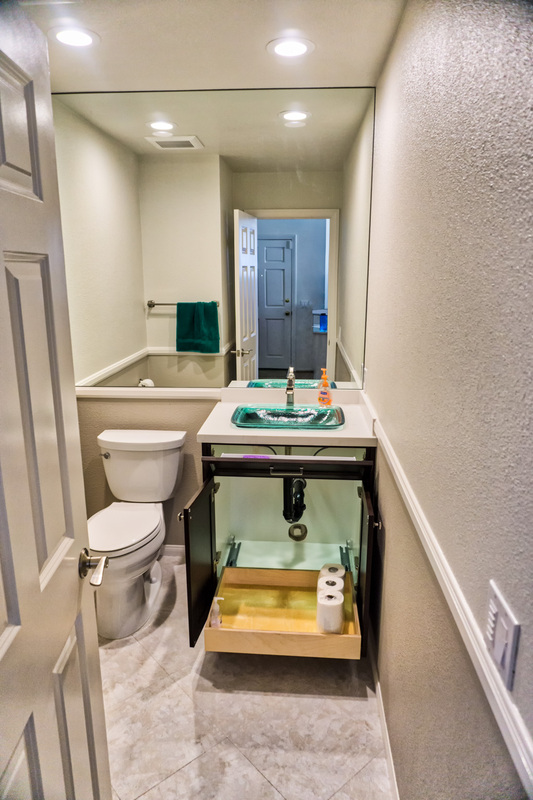 The cabinet only needed to be wide enough for the plumbing pipes, and those pipes can be installed higher up the wall since the trap can be placed much higher with vessel sinks than undermount sinks. This narrower sink base allowed us to fit in hampers on each side of it, one for each teenage boy. 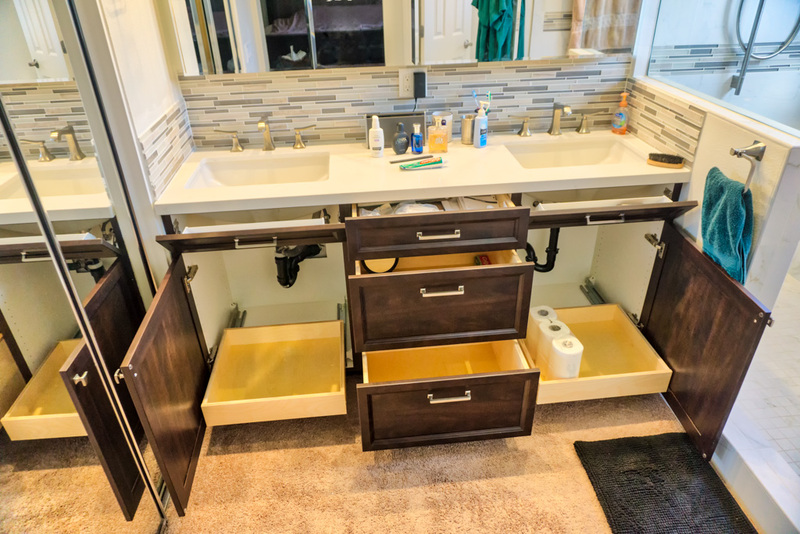 The sink base with its higher trap also allowed us to install two drawers under the sink. 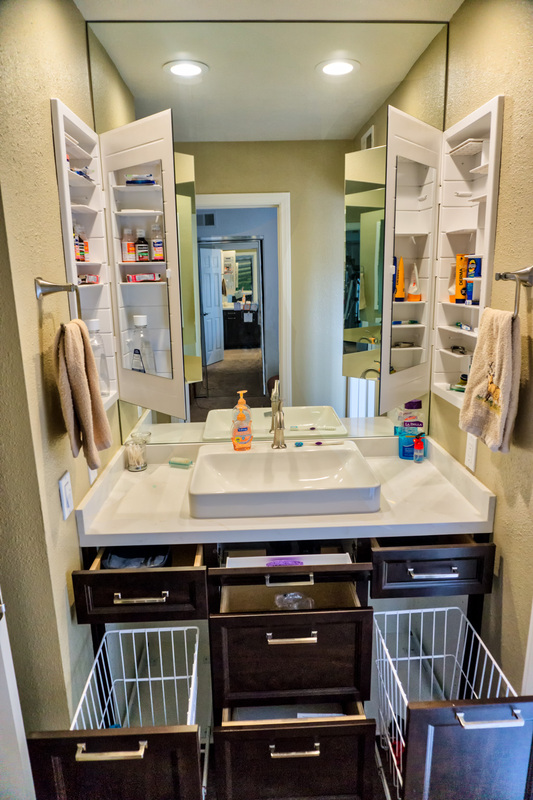 We also installed a medicine cabinet on each side of the sink so each boy has his own storage above to keep as much off the counter as possible. We left the carpeting in this area but did add LVT to the toilet & tub room, since the existing tile floor was severely cracked due to poor installation technique used by the builder. 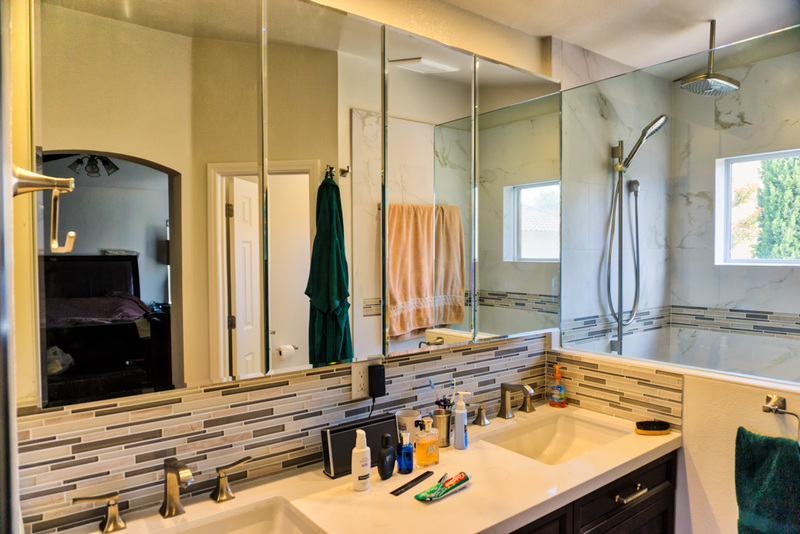 We also removed the fluorescent light box over the sinks and installed LED ceiling lights. 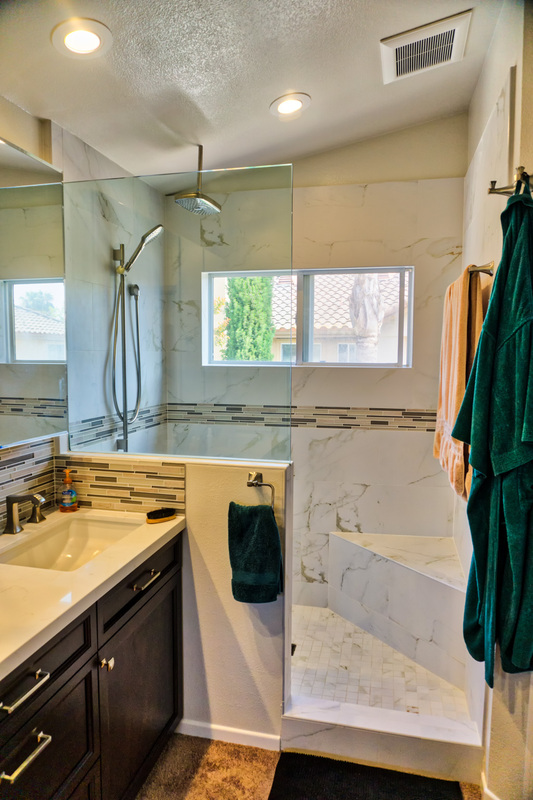 The master bath had the most extensive work done of all the rooms. 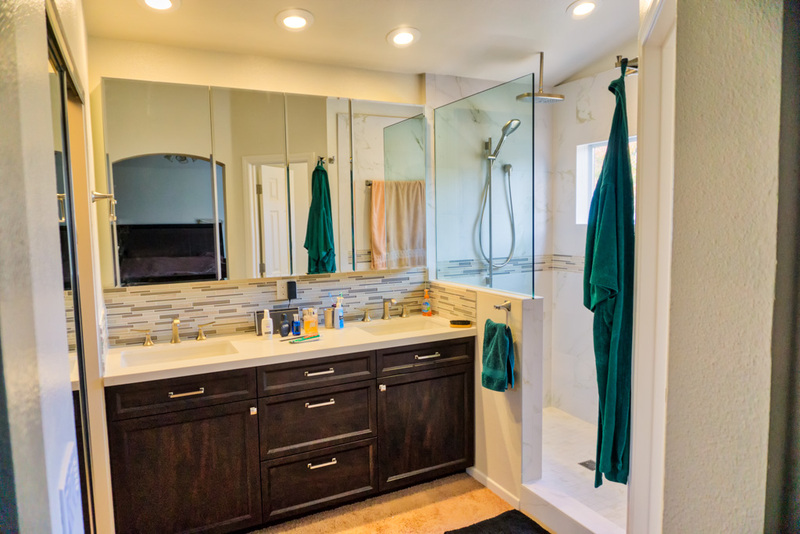 We replaced a tub with a walk-in shower, removed the ceiling light box soffit above the cabinets, installed new LED ceiling cans over the sinks and shower, and added a new 140 cfm exhaust vent over the shower. Take note of the shower area, it has all my functional bath elements for a shower: walk in with no door, large seat, small step in close under the shower, recessed shampoo area hidden out of sight from the rest of the room in the pony wall with glass partition above, and lastly we moved the shower valve from the normal place under the shower head to the pony wall. This places the valve right at the opening of the shower, so no more need to get wet when you turn on the shower to let the water run warm. 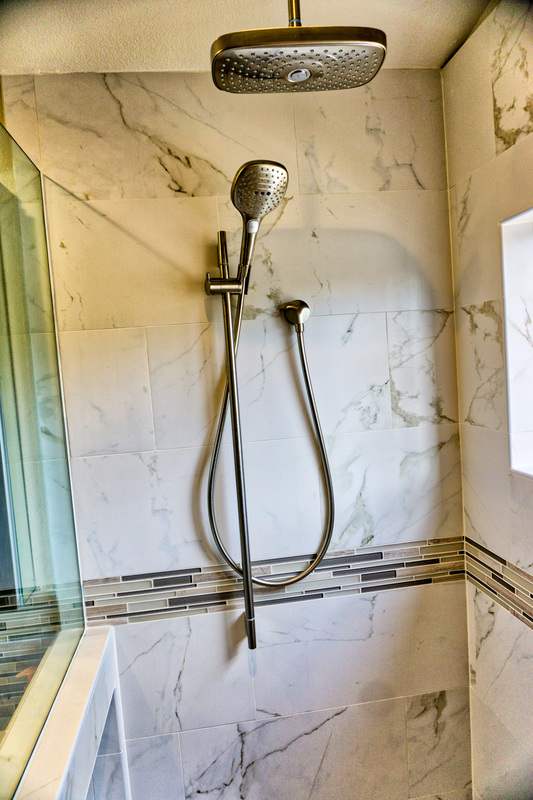 The valve is actually the same distance from person standing in the shower but just 90 degrees to the left, so it is still in a convenient position when in the shower. The cabinet area utilizes the thermofoil wood grain cabinets with drawers and roll-out shelves as we used in the other baths and Robern medicine cabinets for storage above the counter. 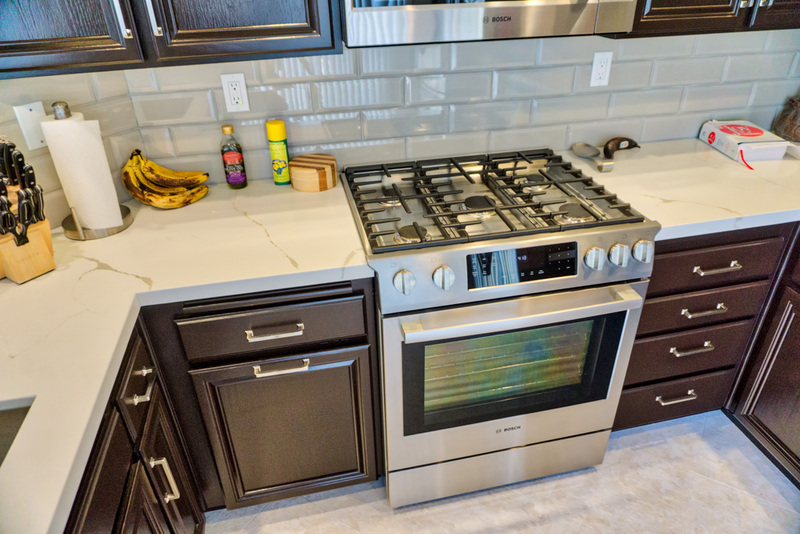 There are 4 of those cabinets linked together, the two center ones have outlets inside so plugged in items can be stored in the cabinet when not in use instead of on the counter. The two outer medicine cabs are hinged so that when they are opened, they create a nice 3 way mirror system. As we do in all our bath projects, the exhaust vents in this project are on preset timer switches, the longest setting being one hour. 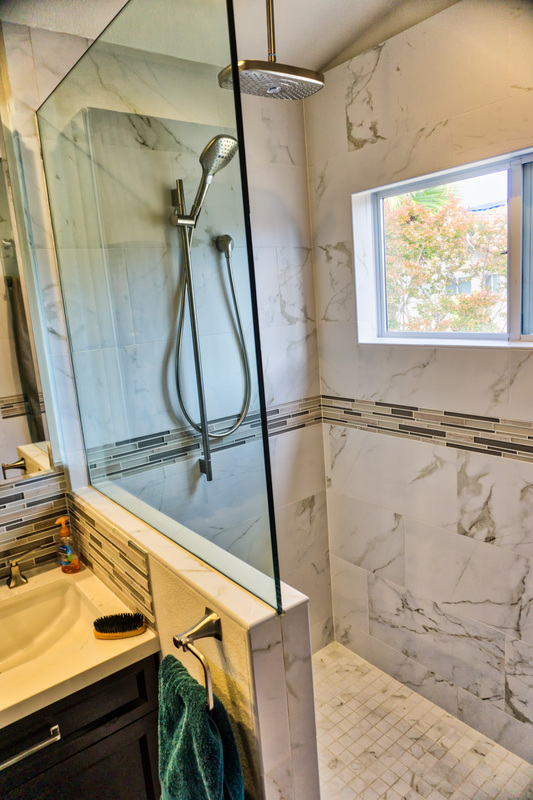 I recommend to always turn on the vent as soon as you turn on the shower, then hit the one hour timer again as you leave the room to allow the fan to continue working to make sure all the moisture is evacuated to make sure the room stays dry and moisture free.